Self storage can be extremely beneficial in many different situations. Whether you’re moving home and need somewhere to store pieces of furniture and other possessions during the process, or are having a house clearout and want to put some items into storage, self storage is an ideal option. Perhaps you have items lying around your home that you do not use but do not want to throw out, or one of your children has gone off to university and you need somewhere to store their belongings. Whatever the situation, self storage can be very helpful during these times. Choosing the right storage company for your needs is essential. If you are currently looking for a storage company, you may find yourself wondering where to start. Of course, most storage company websites will claim that they have the best self storage facilities around, but how do you know when you’ve actually hit the jackpot? While putting items into storage can make life easier in many ways, you want to make sure that you find a reliable and reputable self storage company, particularly if you are trusting them with high value or sentimental possessions. Fortunately, we have put together a small guide on the things that you should consider when choosing a storage company to ensure that you find the right one for you. The safety and security of your items is a top priority, however there are other things to consider too, such as the size and accessibility of storage units, as well as the facilities and location. Read on to find out more. What kind of storage do you need? Firstly, you need to make sure that you choose the right kind of storage for your needs. The last thing you want is to end up with a storage solution that is unsuitable or not cost-effective. Half-filled storage units can be a complete waste of your money; equally, choosing a storage unit that is too small will result in having to rent another unit, costing you more money. This is why it is essential that you work out what size you need beforehand. All good storage companies should offer a variety of different sizes at fair prices. Make a list of all the items that you intend to put into storage and request quotes from various companies based on this list. Before you contact any self storage companies, work out exactly what is going into storage and how long you plan to keep items there. When choosing a storage facility, it is very important that you consider the security and safety of the units. In fact, the security and safety of your items is the most important factor when choosing a self storage provider. Never choose a company that does not have the basics in place. For your peace of mind, you should ensure that the company in question has a decent level of security; this should include lockable access and 24 hour cameras. You may also want to consider insurances and fire protection too. Other safety features to look out for include security guards or shift staff, a fence (which clearly indicates that the property is private and therefore should not be trespassed) and alarm systems. No matter what you are storing away, you should always be able to access your possessions at any time. Not all self storage facilities are open 24/7, so if you need regular access to your unit, you should make sure that you choose a company that is accessible 24 hours a day. For many people, weekday access is fine, but you don’t want to find yourself urgently needing an item out of hours and not being able to access it until the following day. Consider how often you will need to access your items and base your choice on this. When selecting a storage facility, take a look at the upkeep and condition of the place – a well-maintained facility is a good sign that the business owners care about more than just your money. Always inspect the unit before you begin unloading your belongings into it. The unit should be clean and free of any mould, leaks or holes; check for any structural damage and make sure that the floor level in each unit is high enough to avoid water flow. Don’t be afraid to ask about pest control – the last thing you want is animals nibbling on your belongings! If you are storing fragile items, you may also want to make sure that the facility offers climate control in order to keep these items in the best condition possible. Ask the storage company in question what amenities they offer so that you can make the right choice for your needs. Consider the location of the self storage facility in question. If you need constant access to your items, then driving a long way to a remote facility every day will be a waste of time as well as money. If you do not require regular access to your belongings in storage, it may be worth considering a storage facility that is slightly out of town to save you some money. Either way, the storage facility that you choose should not be too far away and should be easily accessible for you. Finally, the price of the storage facility should be reasonable and within your budget. It is always recommended to shop around and never settle for the first self storage company that you come across in order to get the best service. Request at least three quotes from three different companies and compare their prices against their services; this way, you should get the best value for your money. In an ideal world, the company offering the cheapest quote will provide the best service, but in reality this is often not the case. Be wary of companies that offer you suspiciously low and cheap quotes; this could be a sign that they are cutting corners on their security features or the condition of their units. Many companies offer special discounts and offers, particularly if you plan on using their self storage facilities for a long period. Be sure to inquire about any running offers; getting a good deal right from the start is the best way to go. 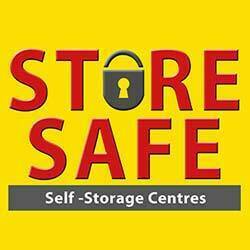 At Store-safe we have been providing secure and affordable storage solutions to residential and commercial clients for over three decades. Our dedicated and skilled team understand the importance of security when it comes to storing your possessions; each member of our team is highly trained and insured to ensure that your items are safely looked after. Our units range in size from 40 to 320 square feet; whether you need to store a few items from a small flat or from a large office building, look no further than us. All of our storage units are protected and monitored by 24-hour CCTV cameras, shift staff and a red-walled Perimeter Protection Alarm System for your peace of mind. If that isn’t enough, we also provide each customer with a free high specification lock worth £45 and unlimited access to their units seven days a week. We pride ourselves on being the most experienced storage service in Stoke on Trent. In addition to our competitive prices, we also offer some amazing discounts. Our aim is to remain the most affordable storage service in the local area. Furthermore, we understand that moving home or office can be challenging and, as a bonus, we offer furniture collection in Stoke on Trent so that you do not even need to pack or transport your items. For more information about our services, visit our website today.